Wrongful Discharge Litigation Strategies provides an authoritative, insider's perspective on assisting plaintiff clients with cases of unfair termination. 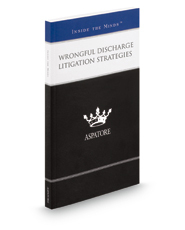 Written by top partners and chairs from across the country, this book discusses the most important elements of wrongful discharge litigation and outlines the ways lawyers can address them. Covering a range of topics from determining which state or federal laws apply to a potential suit to negotiating settlements and damages, these experienced attorneys examine the crucial steps involved in representing employees who have been wrongfully fired. These top lawyers also consider the effects of recent court cases, such as UT Southwestern Medical Center v. Nassar and Vance v. Ball State University, and analyze the rise in multiplaintiff suits in this area. The different niches represented and the breadth of perspectives presented enable readers to get inside some of the great legal minds of today, as these experienced lawyers offer up their thoughts around the keys to success within this ever-changing field.